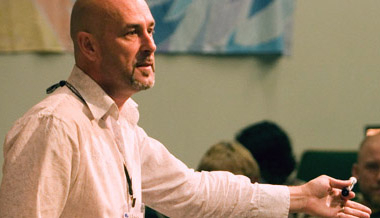 Michael Frost is an internationally recognized Australian missiologist and one of the leading voices in the international missional church movement. His books are required reading in colleges and seminaries around the world and he is much sought after as an international conference speaker. Frost is the Vice Principal of Morling College and the founding Director of the Tinsley Institute, a mission study centre located at Morling College in Sydney, Australia. He is the author or editor of twelve popular Christian books, the most recent of which are the highly successful and award-winning The Shaping of Things to Come (2003, co-authored with colleague Alan Hirsch), Exiles (2006) and Re:Jesus (2009). These books explore a missiological framework for the church in the postmodern era, and their popularity has led to regular speaking engagements at international conferences all around the world. Frost is also a church planter, having launched the missional community, Small Boat Big Sea, in Sydney in 2002. James Finley on the miracle of never dying. Michael Frost talks about Jesus becoming marginalized. Michael Frost suggests the best seats in the house may not be where you think they are. Dinner party etiquette from Luke 14. Michael Frost wonders if Jesus would spend his time doing the things we spend most of our time doing. Michael Frost offers up some "evangelism" ideas - listen, help and care.